The Carpenter Complex is undergoing a couple of changes. 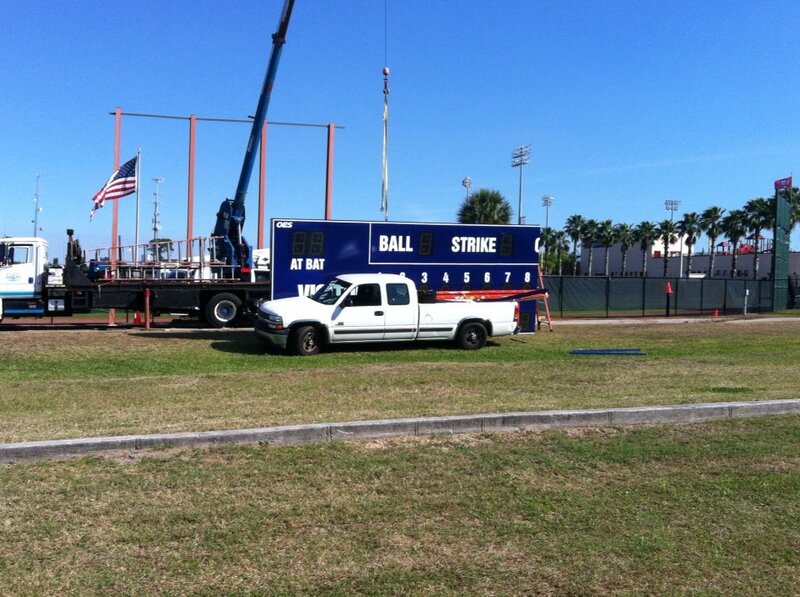 I have been tweeting out pictures of the new scoreboard being installed at the Complex. The first one is finally up behind the right field fence on Ashburn Field. For those not familiar with the naming convention used at the Complex, Ashburn is the field in the south west corner, closest to both the parking lot and the stadium. City of Clearwater employees assemble the scoreboard. Shot from the parking lot. From Ashburn Field the names run alphabetically and clockwise – Ashburn, Carlton, Roberts, and Schmidt. 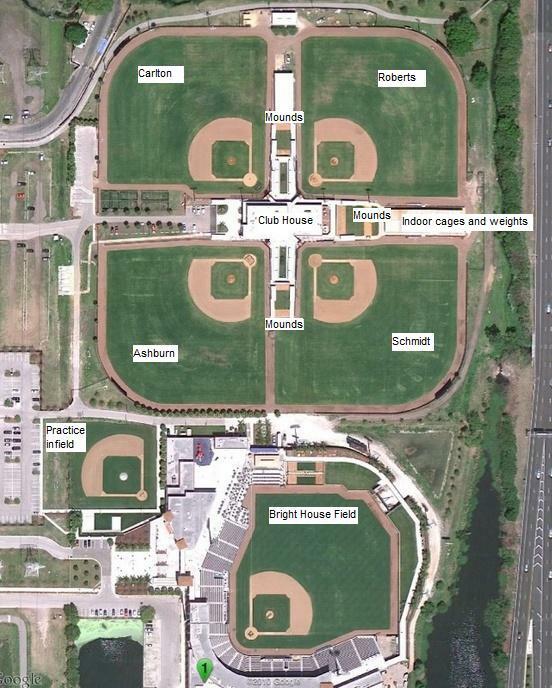 Ashburn is often referred to as the AAA field. Schmidt is on the same side of the Complex as Ashburn but has Route 19 as its eastern border. Scoreboard mounted, shot from first base dugout. Close up from the dugout. Carlton is across the driveway from Ashburn and borders the parking lot. Roberts is the back field, furthest from the parking lot and the stadium. 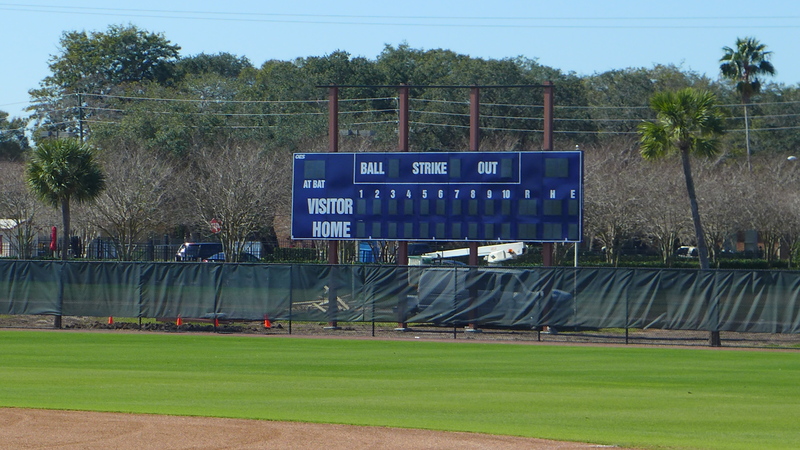 A second scoreboard is being constructed behind the left field fence on Roberts Field. The GCL Phillies play games on both Roberts and Ashburn. We fans prefer Roberts. Even though the home dugout is behind a fence and less accessible, at least there is some shade on that side of the Complex. Overhead shot of the Complex I posted in February 2014. The grounds crews have been busy building up the mounds for spring training. They spent all day Wednesday laying dirt and tamping it down on the mound on Ashburn Field. They were back at it again on Thursday. Opie Cheek was at the Complex, too. Opie is the Field Supervisor at Spectrum Field. The Threshers won the Best Overall Award for the 2016 Florida State League Sports Turf Crew Awards for the 13th year in a row. Opie Cheek was named the Florida State League Sports Turf Manager of the Year for the 13th time. That’s why the fields at the stadium and Complex always look as good as they do. While at the Complex Thursday, I saw and spoke with Reading pitchers Tyler Viza and Jesse Beal. Both are on hand working out prior to the start of spring training in 12 days. Glad they are placing new scoreboard on Roberts field , during Gulf Coast games I could never read the score. It’s funny, it takes an awful lot for them to install high school level score boards on these fields. That said, my favorite thing over the last two springs have been sitting in the highest seat in the crowd (it’s like 7 or 8 seats high, tops) between Roberts and Carlton fields watching a AAA game at Roberts while the AA game goes on at Carlton (you can see both from the same vantage point – you just have to turn your head 180 degrees). It’s minor league baseball nirvana. Even my wife, who is only a fairly casual fan, loved it and stayed 5 or 6 hours. We once sat by Ashburn and Schmidt fields and watched AAA and AA games simultaneously with our back up catcher getting extra hitting by batting in both games every inning. He batted 8 or 9 times and was exhausted. Ashburn is where all the major league back ups, plus the starting rotation minus that day’s starting pitcher, all take BP. This spring, that will be the place to be. My son loves it there to. We go down for a few games this year skipping paying to see a game and just gonna hang out at the complex. Once Chase gets voted into the HoF, they will need to build another field to name after him. Chase Field, that does however sound somewhat familiar. Yankees need more fields, too. 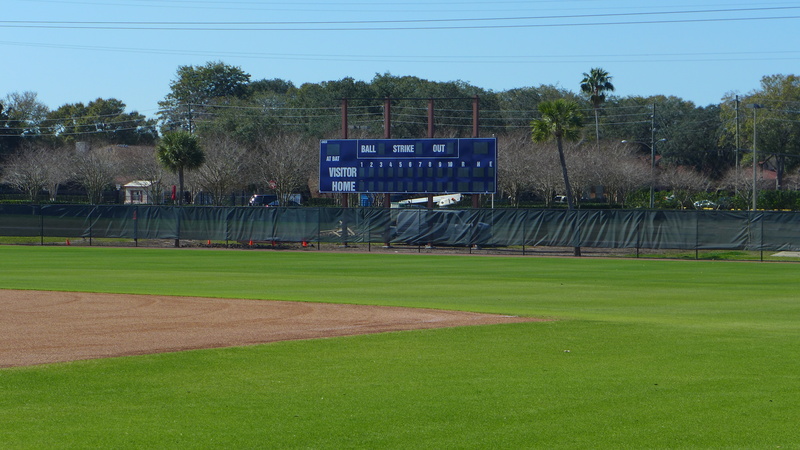 The names of their 4 training fields – Martin, Jeter, Ruth, and Gehrig. Lots of BIG names left out. Still waiting for the addition to the Spectrum’s Tiki Bar to be built…the James Peyton Luxury Lounge. Why does Martin get a field? Any idea? The thing that jumps out is that the field numbers match up with their uniform numbers – Field #1, Billy Martin Field; Field #2, Derek Jeter Field; Field #3, Babe Ruth Field; and Field #4, Lou Gehrig Field. I think someone needs to fire Martin again.